Roo is the best big sister. 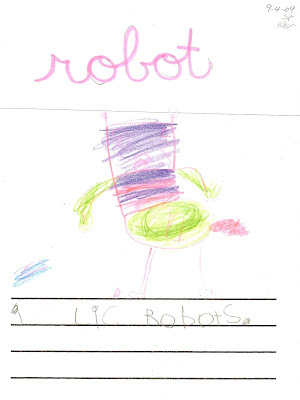 She loves Jasper so much… she made this drawing for the robot boy at school today and was so excited to give it to him. I can practically see your heart jumping out of the screen. I've been wanting to know: what does Jasper think of the Tin Man from the Wizard of Oz? Robot, or not a robot? hhhmm...what a sweetheart sister she is, to think of little brother. That is SO sweet! Did you hang it on his bedroom wall?